They sound similar, but are they the same? In the simplest of terms, PRObiotics are beneficial bacteria, and PREbiotics are the food for that beneficial bacteria! PRObiotics are the healthy gut bugs that live throughout our digestive tract; they help us maintain healthy weight, metabolism, immunity, and mental clarity & wellness. We want our system to be populated with these “friendly” bacteria, rather than by “unfriendly'“ bacteria that can take over when we eat inflammatory foods like canola oil, trans-fats, and excess sugar. To keep your system full of healthy bacteria, it’s important to continue to eat foods that contain the good guys: naturally fermented yogurt, kefir, sauerkraut, pickles, kimchi, & kombucha are all great sources. 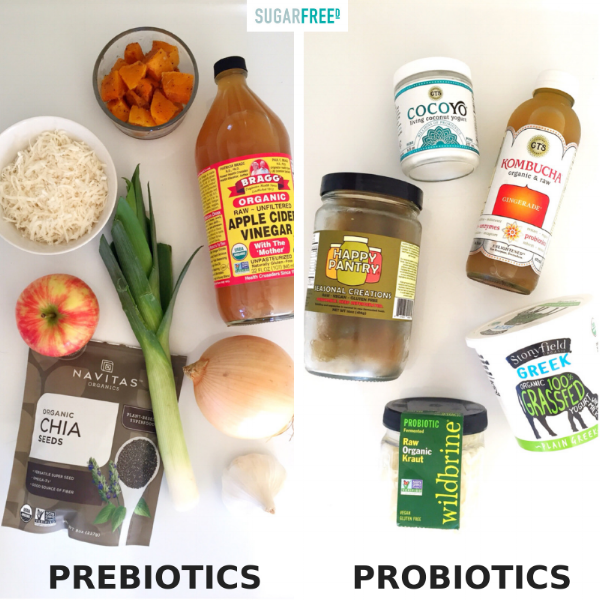 PREbiotic actually refers to the types of fibers we eat which FEED the probiotic bacteria. Eating plenty of prebiotic foods ensures all the probiotic bugs can flourish in your system. PREbiotic foods are plentiful, and include: onions, apples, squashes and sweet potatoes, garlic, apple cider vinegar, leeks, coconut meat, tomatoes, okra, asparagus, chia seeds, greenish bananas, turmeric, radishes, jicama, and Jerusalem artichokes. Remember, it’s super important to eat a diet rich in both PRE and PRObiotics for maximum health benefits. This will keep your system full of an army of healthy gut bugs, and just as importantly, keep that army well fed and ready to fight for your best health!